SALT LAKE CITY (AP) - Will Richardson scored a career-high 19 points to lead Oregon to a 78-72 win over Utah on Thursday night. 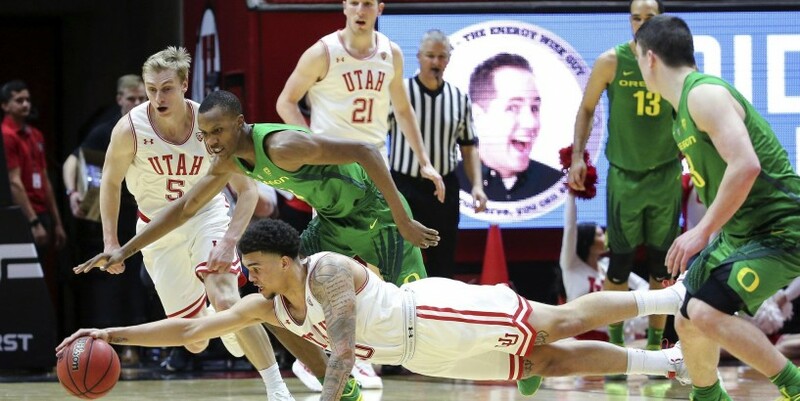 Ehab Amin scored 15 points and Paul White added 14 to compliment the Ducks’ suffocating defense that caused 19 turnovers and frustrated the Utes. Donnie Tillman and Sedrick Barefield each scored 16 for Utah, which saw its four-game winning streak snapped. Barefield was point of focus for the Oregon defense and made just 4 of 16 field goal attempts. After yet another steal, Amin drained a 3-pointer for the Ducks’ largest advantage, 67-53. Parker Van Dyke’s steal and layup brought the Utes within 67-60. Barefield made a 3 to get Utah within 76-72 with 20.3 seconds to play but Payton Pritchard made two free throws - to run his consecutive streak to 26 - and clinch the victory. Early on, the Ducks couldn’t solve Utah’s 2-3 zone that broke down into aggressive man defense. On the other end, Tillman came off the bench and hit three consecutive 3-pointers from the same spot on the left wing. Trailing 30-16, the Ducks’ defense sparked a change. The Ducks forced a shot-clock violation, a 10-second backcourt violation, got a rebound basket and then a steal in the backcourt. Another steal by Amin and a layup by Richardson capped the 11-0 run and closed the gap to 30-27 with 3:37 remaining in the half. Barefield made four throws before the Ducks ended the half with another 11-0 burst, powered by three more steals. Richardson ’s layup just before halftime gave Oregon a 38-34 edge.